Leaving standing canola until at least 50 per cent seed colour change on the main stem will mean higher yield and quality than cutting earlier. These four growers wait until at least that point and are pleased with the results. 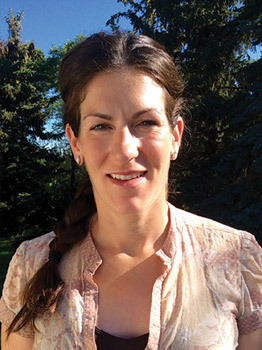 Mary-Jane Duncan learned the value of cutting canola as late as possible after straight combining a field two years ago. They had a full section of L140P, the pod-shatter tolerant variety, but “we were a little nervous about straight combining the whole thing our first time,” she says. So they swathed half of it, going in at 40 percent seed colour change on the main stem. 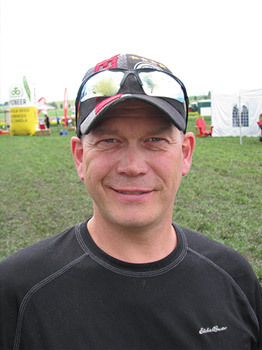 “We had to start swathing when the first fields reached 30 to 40 percent seed colour change because we had 2,000 to 2,500 acres of canola and just one 35-foot swather,” Duncan says. Waiting any longer would mean they swathed the last fields too late. Around the time they swathed the one half, they applied glyphosate on (most of) the other half to prep it for straight cutting. In the end, the straight-cut half yielded 78 bu./ac. “It was our best canola crop ever,” Duncan says. The swathed half yielded 18 bu./ac. less. She noted no major differences between the two halves, meaning no factor other than cut time could have influenced the yield disparity. The Duncans will straight combine about half their acres this year — just the acres seeded to the pod-shatter tolerant variety. But straight combining some of their acres allows them to swath other acres a little later. “We’ll probably start at 50 percent seed colour change now,” she says. As an aside, they will continue to apply pre-harvest glyphosate to straight-combined acres. Two years ago, they hired a plane to apply the glyphosate but it couldn’t finish because of wind. “The storm actually blew the neighbour’s barn roof into our field,” Duncan says. Since acres that didn’t get sprayed were so hard to combine, it was clear to them that pre-harvest glyphosate on Liberty Link L140P was a useful harvest aide. When assessing a field for seed colour change, move in from the headlands. Fertilizer doubled up in headlands can delay maturity. 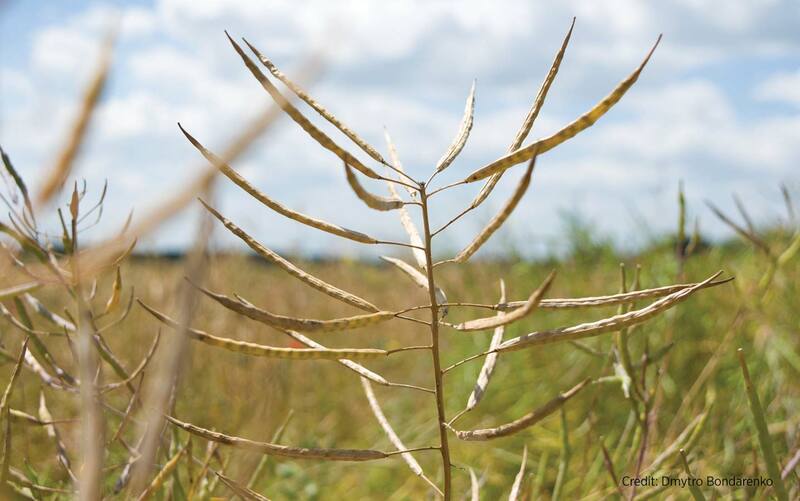 Seeding rates doubled up can mean more plants, fewer branches and earlier maturity. Either way, headland conditions are not usually a good representation of the whole field. 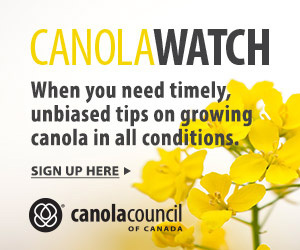 Doug Schmunk says swathing canola later has improved his yield and reduced his green counts. But he is “walking a fine line,” he says. Last year, by swathing mostly at night and early morning or even in the rain, he was able to cut all his canola by the time the last crop reached 65-70 percent seed colour change on the main stem. A little moisture will give a tighter knit to the windrows and, importantly, reduce shattering of the those most mature pods, he says. The year before, he had 50 acres that were swathed too late. Many pods shattered at swathing and many more shattered before the combine picked up with windrows. His evidence was the huge mass of volunteers throughout those acres. but does not expect it to be a big part of his system any time soon. Brian Miller usually starts swathing at 50 to 60 percent seed colour change on the main stem, which he says is three to five days later than most. 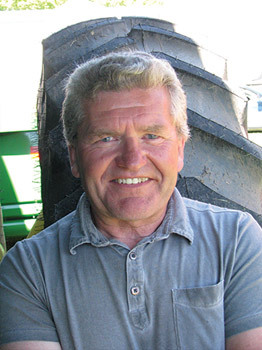 Miller feels that if straight combining yields three to seven percent higher than canola swathed at 30 percent seed colour change, he’s probably half way between. Which is good enough for him. “I don’t like straight combining canola,” he says. One risk he sees with straight combining is snow. In his area, they have had wet snow in early September. This was the case in 2014, when he had 40 acres of standing canola flattened by snow. His swathed canola was OK.
Wind is another risk with standing canola. He has seen lighter crops in his area shelled out severely after an 80 km/h wind. Swaths can also roll in the wind, but he swaths east-west and usually has heavier windrows that don’t seem to roll as much. Rempel has his canola custom swathed. Their swather was older and a neighbour had just bought a new one, so Rempel decided to sell their swather and hire the neighbour to swath for them. Meanwhile, Rempel expects to increase their straight-combined acres. “Equipment-wise, this is how we’d like to move toward,” he says. They straight combined 80 out of 600 canola acres in 2015 and he expects to double that this year, seeding a shatter-tolerant variety with that plan in mind. “It seems to work well. I’m convinced we’re getting extra yield,” he says. Straight combining canola is not something they’ve jumped into. 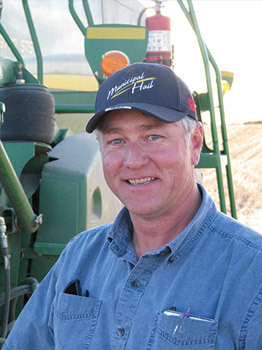 “We bought an AgShield canola pusher 10 or 12 years ago with the plan to do more straight combining, but we had very little success with this technique,” he says. This experience means he’s also familiar with other issues with straight combining, including slower harvesting to put through greener stems and having to quit earlier in the day as the crop toughens up. Using a combination of swathing and straight combining gives the Rempels some flexibility to push swathing dates back and, if too late, to leave those acres for straight combining. Decisions can be quick and last minute. “It seems that once seed colour change begins, it can advance fairly quickly, sometimes going from 40% to 60% in a day,” he says. For more on harvest timing, go to canolawatch.org, click the Harvest & Storage tab and choose “Swath timing” or “Straight combining”.